We have 11 characterful rooms of different shapes and styles, all named after local villages and hamlets surrounding Burford. Highly individual, those in the original part of the building having low ceilings and the odd sloping floor so expect lots of individuality. 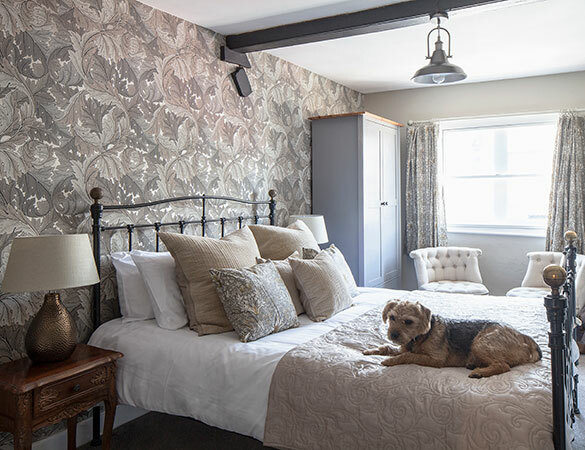 Decorated in a modern English country house style with a mixture of designer fabrics and wallpapers, our rooms are carefully furnished with a mixture of contemporary furniture and some classic pieces. You’ll find Egyptian cotton sheets on our comfortable beds. Each room has a flat screen TV, mini bars and tea & coffee making facilities. 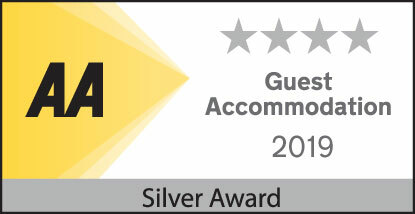 Our premium rooms have four poster beds and Nespresso machines. We will endeavour to accommodate family groups or parties in adjacent rooms and can provide child beds, cots and dog beds (in our dog-friendly rooms) on request. Our largest room with a Super-King Four-Poster bed and overlooking the High Street, original beams and fireplace. Luxuriously decorated in Royal Blue the Burford Room has large-format TV, Nespresso machine & mini-bar, while the bathroom has a cast iron roll-top bath with rain shower. The Widford Room blends traditional with contemporary warm and cool greys. Situated to the rear of the property overlooking the quiet medieval courtyard, Widford boasts a King Four-Poster, Nespresso machine & mini-bar. The bathroom has a bath with shower over. Our Signet Room is located towards the rear of the property. 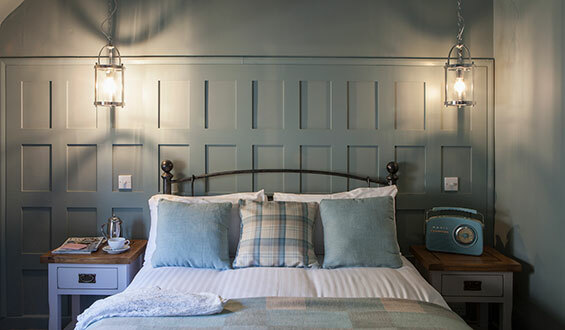 Decorated in stylish duck-egg blue the room features a cast iron double bed. The bathroom has a bath with shower over. Our Fulbrook Room is located at the front of the property with overlooking the High Street. Decorated in Neutral shades with a hunting theme this double room features a bath with shower over. Our Windrush Room is located at the front of the property with overlooking the High Street via a feature bay window. Decorated in classic blue & white the room features a bath with shower over. This is room is also dog friendly. Located on the top floor overlooking the High Street, Swinbrook features original beamed ceiling and sloping eaves. The bathroom has a walk-in shower. With its own private staircase to the top floor, Taynton is decorated in Neutral tones using William Morris fabrics and wallpapers. There is a walk-in shower and this room is also dog friendly. Our Shilton room is a characterful but stylish room with quiet rear aspect and a original fireplace. Shilton boasts a king size bed and the bathroom has a walk in shower. Located on the top floor overlooking the High Street, Upton features original beamed ceiling and sloping eaves. The bathroom has a bath with shower over. One of our largest rooms and located towards the rear of the property, our Filkins room features one double and one single bed and can be used either as a twin by sharers or by families. This room is also dog-friendly. Decorated in warm neutral tones offset with tweed, Asthall is our smallest room but one of our most characterful. Located up in the eaves overlooking the quiet courtyard, this room has a walk-in shower. Our pub’s cosy corners, wooden floors and open fires make the Highway the perfect place to curl up after a long walk, while those holding the lead can have a pint or two. Dogs are allowed in the main bar and courtyard and must be kept on a lead at all times whilst in public areas. We have three dog friendly guest rooms. When checking in for a room stay our four legged friends will enjoy their own treats bowl in their room. All pets are subject to a £10 per stay surcharge.